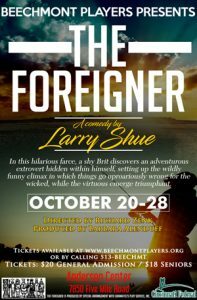 The Foreigner – Beechmont Players, Inc. In this hilarious farce, an incredibly shy young man tries to avoid social interactions by pretending to be a foreigner who speaks no English. As people speak freely around him, he learns a variety of secrets–some frivolous and some dangerous. He also discovers an adventurous extrovert hidden inside himself, setting up the wildly funny climax in which things go uproariously wrong for the wicket, while the virtuous emerge triumphant. "The Foreigner" is presented by special arrangement with Dramatists Play Service, Inc. New York.